This article is about the Arabian sultanate. For the adjacent historical confederation named Trucial Oman, see Trucial States. For other uses, see Oman (disambiguation). Oman (/oʊˈmɑːn/ ( listen) oh-MAHN; Arabic: عمان‎ ʻumān [ʕʊˈmaːn]), officially the Sultanate of Oman (Arabic: سلطنة عُمان‎ Salṭanat ʻUmān), is an Arab country on the southeastern coast of the Arabian Peninsula in Western Asia. Its official religion is Islam. Holding a strategically important position at the mouth of the Persian Gulf, the country shares land borders with the United Arab Emirates to the northwest, Saudi Arabia to the west, and Yemen to the southwest, and shares marine borders with Iran and Pakistan. The coast is formed by the Arabian Sea on the southeast and the Gulf of Oman on the northeast. The Madha and Musandam exclaves are surrounded by the UAE on their land borders, with the Strait of Hormuz (which it shares with Iran) and Gulf of Oman forming Musandam's coastal boundaries. From the late 17th century, the Omani Sultanate was a powerful empire, vying with Portugal and the UK for influence in the Persian Gulf and Indian Ocean. At its peak in the 19th century, Omani influence or control extended across the Strait of Hormuz to modern-day Iran and Pakistan, and as far south as Zanzibar. When its power declined in the 20th century, the sultanate came under the influence of the United Kingdom. For over 300 years, the relations built between the two empires were based on mutual benefits. The UK recognized Oman's geographical importance as a trading hub that secured their trade lanes in the Arabian Gulf and Indian Ocean and protected their empire in the Indian sub-continent. By contrast, the British strengthened Oman's internal unity and allied the sultanate against external threats. [unreliable source?] Historically, Muscat was the principal trading port of the Persian Gulf region. Muscat was also among the most important trading ports of the Indian Ocean. The Sultan Qaboos bin Said al Said has been the hereditary leader of the country, an absolute monarchy, since 1970. Sultan Qaboos is the longest-serving current ruler in the Middle East, and third-longest current reigning monarch in the world. Oman is a member of the United Nations, the Arab League, the Gulf Cooperation Council, the Non-Aligned Movement and the Organisation of Islamic Cooperation. It has sizable oil reserves, ranking 25th globally. In 2010, the United Nations Development Programme ranked Oman as the most improved nation in the world in terms of development during the preceding 40 years. A significant portion of its economy involves tourism and trade of fish, dates, and certain agricultural produce. Oman is categorized as a high-income economy and ranks as the 70th most peaceful country in the world according to the Global Peace Index. At Aybut Al Auwal, in the Dhofar Governorate of Oman, a site was discovered in 2011 containing more than 100 surface scatters of stone tools, belonging to a regionally specific African lithic industry—the late Nubian Complex—known previously only from the northeast and Horn of Africa. Two optically stimulated luminescence age estimates place the Arabian Nubian Complex at 106,000 years old. This supports the proposition that early human populations moved from Africa into Arabia during the Late Pleistocene. In recent years known primarily from survey finds, Palaeolithic and Neolithic sites have come to light most on the eastern coast. 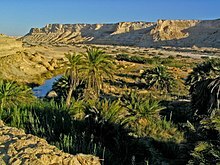 Main Palaeolithic sites include Saiwan-Ghunaim in the Barr al-Hikman. Archaeological remains are particularly numerous for the Bronze Age Umm an-Nar and Wadi Suq periods. Sites such as Bat show professional wheel-turned pottery, excellent hand-made stone vessels, a metals industry, and monumental architecture . The Early (1300‒300 BC) and Late Iron Ages (100 BC‒300 AD) show more differences than similarities to each other. Thereafter, until the coming of the Ibadhidya, little or nothing is known. Sumerian tablets refer to a country called Magan and Akkadian ones Makan, a name which links Oman's ancient copper resources. Mazoon, a Persian name used for the region. Over centuries tribes from the west settled in Oman, making a living by fishing, farming, herding or stock breeding, and many present day Omani families trace their ancestral roots to other parts of Arabia. When the emigrants from northern-western and south-western Arabia arrived in Oman, they had to compete with the indigenous population for the best arable land. In the 1970s and 1980s scholars like John C. Wilkinson believed by virtue of oral history that in the 6th century BC, the Achaemenids exerted control over the Omani peninsula, most likely ruling from a coastal center such as Suhar. Central Oman has its own indigenous Samad Late Iron Age cultural assemblage named eponymously from Samad al-Shan. In the northern part of the Oman Peninsula the Recent Pre-Islamic Period begins in the 3rd century BC and extends into the 3rd century AD. Whether or not Persians brought south-eastern Arabian under their control is a moot point, since the lack of Persian finds speak against this belief. Four centuries later, Omanis came in contact with and accepted Islam. The conversion of Oman is usually ascribed to Amr ibn al-As, who was sent by the prophet Muhammad during the Expedition of Zaid ibn Haritha (Hisma). A decade after Vasco da Gama's successful voyage around the Cape of Good Hope and to India in 1497–98, the Portuguese arrived in Oman and occupied Muscat for a 143-year period, from 1507 to 1650. Their fortress still remains. In need of an outpost to protect their sea lanes, the Portuguese built up and fortified the city, where remnants of their colonial architectural style still exist. 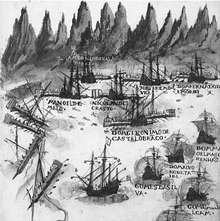 An Ottoman fleet captured Muscat in 1552, during the fight for control of the Persian Gulf and the Indian Ocean. The Ottoman Turks captured Muscat from the Portuguese in 1581 and held it until 1588. Rebellious tribes eventually drove out the Portuguese, but were themselves pushed out about a century later, in 1741, by the leader of an Omani tribe, who began the current line of ruling sultans. Except for a brief Persian invasion in the late 1740s, Oman has been self-governing ever since. In the 1690s, Saif bin Sultan, the Imam of Oman, pressed down the Swahili Coast. A major obstacle to his progress was Fort Jesus, housing the garrison of a Portuguese settlement at Mombasa. After a two-year siege, the fort fell to bin Sultan in 1698. Thereafter the Omanis easily ejected the Portuguese from Zanzibar and from all other coastal regions north of Mozambique. The Persians invaded Oman in 1737. They were driven out in 1749 when the Al Said dynasty came to power. It continues to rule Oman to this day. Zanzibar was a valuable property as the main slave market of the Swahili Coast, and became an increasingly important part of the Omani empire, a fact reflected by the decision of the 19th century Imam of Muscat, Sa'id ibn Sultan, to make it his main place of residence in 1837. Sa'id built impressive palaces and gardens in Zanzibar. Rivalry between his two sons was resolved, with the help of forceful British diplomacy, when one of them, Majid, succeeded to Zanzibar and to the many regions claimed by the family on the Swahili Coast. The other son, Thuwaini, inherited Muscat and Oman. Zanzibar influences in the Comoros archipelago in the Indian Ocean indirectly introduced Omani customs to the Comorian culture. These influences include clothing traditions and wedding ceremonies. In 1783, Oman's Seyyid Sultan, defeated ruler of Muscat, was granted sovereignty over Gwadar. This coastal city is located in the Makran region of what is now the far southwestern corner of Pakistan, near the present-day border of Iran, at the mouth of the Gulf of Oman. [note 1] After regaining control of Muscat, this sovereignty was continued via an appointed wali ("governor"). The Al Hajar Mountains, of which the Jebel Akhdar is a part, separate the country into two distinct regions: the interior, known as Oman, and the coastal area dominated by the capital, Muscat. In 1913, control of the country split. The interior was ruled by Ibadite imams and the coastal areas by the sultan. Under the terms of the British-brokered Treaty of Seeb of 1920, the sultan recognised the autonomy of the interior. The Sultan of Muscat would be responsible for the external affairs of Oman. The rule of Sultan Said bin Taimur was characterised by a feudal and isolationist approach. Imam Ghalib Alhinai was the elected Imam of the Imamate of Oman in May 1954. Relations between the Sultan of Muscat, Said bin Taimur, and Imam Ghalib Alhinai were ruptured over a dispute concerning the right to grant oil concessions. A subsidiary of the Iraq Petroleum Company was intensely interested in some promising geological formations near Fahud. Under the terms of the 1920 treaty of Seeb, the Sultan claimed all dealings with the oil company as his prerogative. The Imam, on the other hand, claimed that since the oil was in his territory, anything dealing with it was an internal matter. In December 1955, Sultan Said bin Taimur sent troops of the Muscat and Oman Field Force to occupy the main centres in Oman, including Nizwa, the capital of the Imamate of Oman, and Ibri. Imam Ghalib Alhinai and his younger brother, Talib bin Ali Alhinai, led the Imamate of Oman in the Jebel Akhdar War against Sultan Said bin Taimur's attack on his lands. In July 1957, the Sultan's forces were withdrawing, but they were repeatedly ambushed, sustaining heavy casualties. Sultan Said bin Taimur, however, with the intervention of infantry (two companies of the Cameronians), armoured car detachments from the British Army and RAF aircraft, was able to suppress the rebellion. Talib's forces retreated to the inaccessible Jebel Akhdar. Colonel David Smiley, who had been seconded to organize the Sultan's Armed Forces, managed to isolate the mountain in autumn 1958 and found a route to the plateau from Wadi Bani Kharus. On 27 January 1959, they occupied the mountain in a surprise operation. Ghalib, Talib and Sulaiman managed to escape to Saudi Arabia, where the Imamate's cause was promoted until the 1970s. Imam Ghalib delegated his brother, Talib Alhinai, to present the issue to the Arab League and the United Nations in order to seek recognition of the Imamate of Oman by peaceful means. In 1955, the exclave coastal Makran strip acceded to Pakistan and was made a district of its Balochistan province, while Gwadar was not included in Makran then. On 8 September 1958, Pakistan purchased the Gwadar enclave from Oman for US$3 million. [note 2] Gwadar then became a tehsil in the Makran district. Oil reserves were discovered in 1964 and extraction began in 1967. In the Dhofar Rebellion, which began in 1965, leftist forces were pitted against government troops. As the rebellion threatened to overthrow the Sultan's rule in Dhofar, Sultan Said bin Taimur was deposed in a bloodless coup (1970) by his son Qaboos bin Said, who expanded the Sultan of Oman's Armed Forces, modernised the state's administration and introduced social reforms. The uprising was finally put down in 1975 with the help of forces from Iran, Jordan, Pakistan and the British Royal Air Force, army and Special Air Service. After deposing his father in 1970, Sultan Qaboos opened up the country, embarked on economic reforms, and followed a policy of modernisation marked by increased spending on health, education and welfare. Slavery, once a cornerstone of the country's trade and development, was outlawed in 1970. In 1981 Oman became a founding member of the six-nation Gulf Cooperation Council. Political reforms were eventually introduced. Historically, voters had been chosen from among tribal leaders, intellectuals, and businessmen. In 1997 Sultan Qaboos decreed that women could vote for, and stand for election to, the Majlis al-Shura, the Consultative Assembly of Oman. Two women were duly elected to the body. In 2002, voting rights were extended to all citizens over the age of 21, and the first elections to the Consultative Assembly under the new rules were held in 2003. In 2004, the Sultan appointed Oman's first female minister with portfolio, Sheikha Aisha bint Khalfan bin Jameel al-Sayabiyah. She was appointed to the post of National Authority for Industrial Craftsmanship, an office that attempts to preserve and promote Oman's traditional crafts and stimulate industry. Despite these changes, there was little change to the actual political makeup of the government. The Sultan continued to rule by decree. Nearly 100 suspected Islamists were arrested in 2005 and 31 people were convicted of trying to overthrow the government. They were ultimately pardoned in June of the same year. Inspired by the Arab Spring uprisings taking place throughout the region, protests occurred in Oman during the early months of 2011. Although they did not call for the ousting of the regime, demonstrators demanded political reforms, improved living conditions, and the creation of more jobs. They were dispersed by riot police in February 2011. Sultan Qaboos reacted by promising jobs and benefits. In October 2011, elections were held to the Consultative Assembly, to which Sultan Qaboos promised greater powers. The following year, the government began a crackdown on internet criticism. In September 2012, trials began of 'activists' accused of posting "abusive and provocative" criticism of the government online. Six were given jail terms of 12–18 months and fines of around $2,500 each. Oman lies between latitudes 16° and 28° N, and longitudes 52° and 60° E. A vast gravel desert plain covers most of central Oman, with mountain ranges along the north (Al Hajar Mountains) and southeast coast (Qara or Dhofar Mountains), where the country's main cities are also located: the capital city Muscat, Sohar and Sur in the north, and Salalah in the south. Oman's climate is hot and dry in the interior and humid along the coast. During past epochs, Oman was covered by ocean, witnessed by the large numbers of fossilized shells existing in areas of the desert away from the modern coastline. The peninsula of Musandam (Musandem) exclave, which has a strategic location on the Strait of Hormuz, is separated from the rest of Oman by the United Arab Emirates. The series of small towns known collectively as Dibba are the gateway to the Musandam peninsula on land and the fishing villages of Musandam by sea, with boats available for hire at Khasab for trips into the Musandam peninsula by sea. Oman's other exclave, inside UAE territory, known as Madha, located halfway between the Musandam Peninsula and the main body of Oman, is part of the Musandam governorate, covering approximately 75 km2 (29 sq mi). Madha's boundary was settled in 1969, with the north-east corner of Madha barely 10 m (32.8 ft) from the Fujairah road. Within the Madha exclave is a UAE enclave called Nahwa, belonging to the Emirate of Sharjah. Situated about 8 km (5 mi) along a dirt track west of the town of New Madha, consisting of about forty houses with a clinic and telephone exchange. The central desert of Oman is an important source of meteorites for scientific analysis. Like the rest of the Persian Gulf, Oman generally has one of the hottest climates in the world—with summer temperatures in Muscat and northern Oman averaging 30 to 40 °C (86.0 to 104.0 °F). Oman receives little rainfall, with annual rainfall in Muscat averaging 100 mm (3.9 in), falling mostly in January. In the south, the Dhofar Mountains area near Salalah has a tropical-like climate and receives seasonal rainfall from late June to late September as a result of monsoon winds from the Indian Ocean, leaving the summer air saturated with cool moisture and heavy fog. Summer temperatures in Salalah range from 20 to 30 °C (68.0 to 86.0 °F)—relatively cool compared to northern Oman. The mountain areas receive more rainfall, and annual rainfall on the higher parts of the Jabal Akhdar probably exceeds 400 mm (15.7 in). Low temperatures in the mountainous areas result in snow cover once every few years. Some parts of the coast, particularly near the island of Masirah, sometimes receive no rain at all within the course of a year. The climate is generally very hot, with temperatures reaching around 50 °C (122.0 °F) (peak) in the hot season, from May to September. On June 26, 2018 the city of Qurayyat, Oman set the record for highest minimum temperature in a 24-hour period, 42.6 °C (108.7 °F). Desert shrub and desert grass, common to southern Arabia, are found in Oman, but vegetation is sparse in the interior plateau, which is largely gravel desert. The greater monsoon rainfall in Dhofar and the mountains makes the growth there more luxuriant during summer; coconut palms grow plentifully in the coastal plains of Dhofar and frankincense is produced in the hills, with abundant oleander and varieties of acacia. The Al Hajar Mountains are a distinct ecoregion, the highest points in eastern Arabia with wildlife including the Arabian tahr. Indigenous mammals include the leopard, hyena, fox, wolf, hare, oryx, and ibex. Birds include the vulture, eagle, stork, bustard, Arabian partridge, bee eater, falcon, and sunbird. In 2001, Oman had nine endangered species of mammals, five endangered types of birds, and nineteen threatened plant species. Decrees have been passed to protect endangered species, including the Arabian leopard, Arabian oryx, mountain gazelle, goitered gazelle, Arabian tahr, green sea turtle, hawksbill turtle, and olive ridley turtle. However, the Arabian Oryx Sanctuary is the first site ever to be deleted from UNESCO's World Heritage List, due to the government's decision to reduce the site to 10% of its former size so that the remainder could be opened to oil prospectors. In recent years, Oman has become one of newer hot spots for whale watching, highlighting the critically endangered Arabian humpback whale, the most isolated and only non-migratory population in the world, sperm whales, and pygmy blue whales. Drought and limited rainfall contribute to shortages in the nation's water supply. Maintaining an adequate supply of water for agricultural and domestic use is one of Oman's most pressing environmental problems, with limited renewable water resources. 94% of available water is used in farming and 2% for industrial activity, with the majority sourced from fossil water in the desert areas and spring water in hills and mountains. Drinking water is available throughout Oman, either piped or delivered. The soil in coastal plains, such as Salalah, have shown increased levels of salinity, due to over exploitation of ground water and encroachment by seawater on the water table. Pollution of beaches and other coastal areas by oil tanker traffic through the Strait of Hormuz and Gulf of Oman is also a persistent concern. Local and national entities have noted unethical treatment of animals in Oman. In particular, stray dogs (and to a lesser extent, stray cats) are often the victims of torture, abuse or neglect. Currently, the only approved method of decreasing the stray dog population is shooting by police officers. The Oman government has refused to implement a spay and neuter program or create any animal shelters in the country. Cats, while seen as more acceptable than dogs, are viewed as pests and frequently die of starvation or illness. Oman is a unitary state and an absolute monarchy, in which all legislative, executive and judiciary power ultimately rests in the hands of the hereditary Sultan. Freedom House has routinely rated the country "Not Free" as it is an absolute monarchy. Sultan Qaboos is the head of state and also directly controls the foreign affairs and defence portfolios. The sultan has absolute power and issues laws by decree. He is also the longest-serving ruler in the Middle East. Oman is an absolute monarchy, with the Sultan's word having the force of law. The judiciary branch is subordinate to the Sultan. According to Oman's constitution, Sharia law is one of the sources of legislation. Sharia court departments within the civil court system are responsible for family-law matters, such as divorce and inheritance. The country has no system of checks and balances, and thus no separation of powers. All power is concentrated in the Sultan, who is also chief of staff of the armed forces, Minister of Defence, Minister of Foreign Affairs and chairman of the Central Bank. All legislation since 1970 has been promulgated through royal decrees, including the 1996 Basic Law. The Sultan appoints judges, and can grant pardons and commute sentences. The Sultan's authority is inviolable and the Sultan expects total subordination to his will. The administration of justice is highly personalized, with limited due process protections, especially in political and security-related cases. The Basic Statute of the State is supposedly the cornerstone of the Omani legal system and it operates as a constitution for the country. The Basic Statute was issued in 1996 and thus far has only been amended once, in 2011, in response to protests. Though Oman's legal code theoretically protects civil liberties and personal freedoms, both are regularly ignored by the regime. Women and children face legal discrimination in many areas. Women are excluded from certain state benefits, such as housing loans, and are refused equal rights under the personal status law. Women also experience restrictions on their self-determination in respect to health and reproductive rights. Since the beginning of the “Omani Spring” in January 2011, a number of serious violations of civil rights have been reported, amounting to a critical deterioration of the human rights situation. Prisons are not accessible to independent monitors. Members of the independent Omani Group of Human Rights have been harassed, arrested and sentenced to jail. There have been numerous testimonies of torture and other inhumane forms of punishment perpetrated by security forces on protesters and detainees. The detainees were all peacefully exercising their right to freedom of expression and assembly. Although authorities must obtain court orders to hold suspects in pre-trial detention, they do not regularly follow these procedures. The penal code was amended in October 2011 to allow the arrest and detention of individuals without an arrest warrant from public prosecutors. The Omani legislature is the bicameral Council of Oman, consisting of an upper chamber, the Council of State (Majlis ad-Dawlah) and a lower chamber, the Consultative Council (Majlis ash-Shoura). Political parties are banned. The upper chamber has 71 members, appointed by the Sultan from among prominent Omanis; it has only advisory powers. The 84 members of the Consultative Council are elected by popular vote to serve four-year terms, but the Sultan makes the final selections and can negotiate the election results. The members are appointed for three-year terms, which may be renewed once. The last elections were held on October 2011. Oman's national anthem, As-Salam as-Sultani is dedicated to Sultan Qaboos. Oman is an absolute monarchy by male primogeniture. The present Sultan, Qaboos bin Said al Said, has been the hereditary leader of the country since 1970. Homosexual acts are illegal in Oman. The practice of torture is widespread in Oman state penal institutions and has become the state's typical reaction to independent political expression. Torture methods in use in Oman include mock execution, beating, hooding, solitary confinement, subjection to extremes of temperature and to constant noise, abuse and humiliation. There have been numerous reports of torture and other inhumane forms of punishment perpetrated by Omani security forces on protesters and detainees. Several prisoners detained in 2012 complained of sleep deprivation, extreme temperatures, and solitary confinement. Omani authorities kept Sultan al-Saadi, a social media activist, in solitary confinement, denied him access to his lawyer and family, forced him to wear a black bag over his head whenever he left his cell, including when using the restroom, and told him his family had “forsaken” him and asked for him to be imprisoned. Nabhan al-Hanashi, an exiled Omani writer now living in the UK, is an author whose books are banned in Oman. The Omani government decides who can or cannot be a journalist and this permission can be withdrawn at any time. Censorship and self-censorship are a constant factor. Omanis have limited access to political information through the media. Access to news and information can be problematic: journalists have to be content with news compiled by the official news agency on some issues. Through a decree by the Sultan, the government has now extended its control over the media to blogs and other websites. Omanis cannot hold a public meeting without the government's approval. Omanis who want to set up a non-governmental organisation of any kind need a licence. To get a licence, they have to demonstrate that the organisation is "for legitimate objectives" and not "inimical to the social order". The Omani government does not permit the formation of independent civil society associations. Human Rights Watch issued on 2016, that an Omani court sentenced three journalists to prison and ordered the permanent closure of their newspaper, over an article that alleged corruption in the judiciary. The law prohibits criticism of the Sultan and government in any form or medium. Oman's police do not need search warrants in order to enter people's homes. The law does not provide citizens with the right to change their government. The Sultan retains ultimate authority on all foreign and domestic issues. Government officials are not subject to financial disclosure laws. Libel laws and concerns for national security have been used to suppress criticism of government figures and politically objectionable views. Publication of books is limited and the government restricts their importation and distribution, as with other media products. Merely mentioning the existence of such restrictions can land Omanis in trouble. In 2009, a web publisher was fined and given a suspended jail sentence for revealing that a supposedly live TV programme was actually pre-recorded in order to eliminate any criticisms of the government. Faced with so many restrictions, Omanis have resorted to unconventional methods for expressing their views. Omanis sometimes use donkeys to express their views. Writing about Gulf rulers in 2001, Dale Eickelman observed: "Only in Oman has the occasional donkey… been used as a mobile billboard to express anti-regime sentiments. There is no way in which police can maintain dignity in seizing and destroying a donkey on whose flank a political message has been inscribed." Omani citizens need government permission to marry foreigners. The Ministry of Interior requires Omani citizens to obtain permission to marry foreigners (except nationals of GCC countries); permission is not automatically granted. Citizen marriage to a foreigner abroad without ministry approval may result in denial of entry for the foreign spouse at the border and preclude children from claiming citizenship rights. It also may result in a bar from government employment and a fine of 2,000 rials ($5,200). According to HRW, women in Oman face discrimination. In August 2014, The Omani writer and human rights defender Mohammed Alfazari, the founder and editor-in-chief of the e-magazine Mowatin “Citizen”, disappeared after going to the police station in the Al-Qurum district of Muscat. For several months the Omani government denied his detention and refused to disclose information about his whereabouts or condition. On July 17, 2015, Al Fazari left Oman seeking political asylum in UK after a travel ban was issued against him without providing any reasons and after his official documents including his national ID and passport were confiscated for more than 8 months. There were more reports of politically motivated disappearances in the country. In 2012, armed security forces arrested Sultan al-Saadi, a social media activist. According to reports, authorities detained him at an unknown location for one month for comments he posted online critical of the government. Authorities previously arrested al-Saadi in 2011 for participating in protests and again in 2012 for posting comments online deemed insulting to Sultan Qaboos. In May 2012 security forces detained Ismael al-Meqbali, Habiba al-Hinai, and Yaqoub al-Kharusi, human rights activists who were visiting striking oil workers. Authorities released al-Hinai and al-Kharusi shortly after their detention but did not inform al-Meqbali's friends and family of his whereabouts for weeks. Authorities pardoned al-Meqbali in March. In December 2013, a Yemeni national disappeared in Oman after he was arrested at a checkpoint in Dhofar Governorate. Omani authorities refuse to acknowledge his detention. His whereabouts and condition remain unknown. The National Human Rights Commission, established in 2008, is not independent from the regime. It is chaired by the former deputy inspector general of Police and Customs and its members are appointed by royal decree. In June 2012, one of its members requested that she be relieved of her duties because she disagreed with a statement made by the Commission justifying the arrest of intellectuals and bloggers and the restriction of freedom of expression in the name of respect for “the principles of religion and customs of the country”. Since the beginning of the “Omani Spring” in January 2011, a number of serious violations of civil rights has been reported, amounting to a critical deterioration of the human rights situation. Prisons are inaccessible to independent monitors. Members of the independent Omani Group of Human Rights have been harassed, arrested and sentenced to jail. There have been numerous testimonies of torture and other inhumane forms of punishment perpetrated by security forces on protesters and detainees. The detainees were all peacefully exercising their right to freedom of expression and assembly. Although authorities must obtain court orders to hold suspects in pre-trial detention, they do not regularly do this. The penal code was amended in October 2011 to allow the arrest and detention of individuals without an arrest warrant from public prosecutors. In January 2014, Omani intelligence agents arrested a Bahraini actor and handed him over to the Bahraini authorities on the same day of his arrest. The actor has been subjected to a forced disappearance, his whereabouts and condition remain unknown. The plight of domestic workers in Oman is a taboo subject. In 2011, the Philippines government determined that out of all the countries in the Middle East, only Oman and Israel qualify as safe for Filipino migrants. In 2012, it was reported that every 6 days, an Indian migrant in Oman commits suicide. There has been a campaign urging authorities to check the migrant suicide rate. In the 2014 Global Slavery Index, Oman is ranked #45 due to 26,000 people in slavery. The descendants of servant tribes and slaves are victims of widespread discrimination. Oman was one of the last countries to abolish slavery in 1970. U.S. Secretary of State John Kerry meets with Sultan Qaboos in Muscat, May 2013. Since 1970, Oman has pursued a moderate foreign policy, and has expanded its diplomatic relations dramatically. Oman is among the very few Arab countries that have maintained friendly ties with Iran. WikiLeaks disclosed US diplomatic cables which state that Oman helped free British sailors captured by Iran's navy in 2007. The same cables also portray the Omani government as wishing to maintain cordial relations with Iran, and as having consistently resisted US diplomatic pressure to adopt a sterner stance. Yusuf bin Alawi bin Abdullah is the Sultanate's Minister Responsible for Foreign Affairs. Oman allowed the British Royal Navy and Indian Navy access to the port facilities of Al Duqm Port & Drydock. Oman's military manpower totalled 44,100 in 2006, including 25,000 men in the army, 4,200 sailors in the navy, and an air force with 4,100 personnel. The Royal Household maintained 5,000 Guards, 1,000 in Special Forces, 150 sailors in the Royal Yacht fleet, and 250 pilots and ground personnel in the Royal Flight squadrons. Oman also maintains a modestly sized paramilitary force of 4,400 men. The Royal Army of Oman had 25,000 active personnel in 2006, plus a small contingent of Royal Household troops. Despite a comparative large military spending, it has been relatively slow to modernize its forces. Oman has a relatively limited number of tanks, including 6 M60A1, 73 M60A3, and 38 Challenger 2 main battle tanks, as well as 37 aging Scorpion light tanks. The Royal Air Force of Oman has approximately 4,100 men, with only 36 combat aircraft and no armed helicopters. Combat aircraft include 20 aging Jaguars, 12 Hawk Mk 203s, 4 Hawk Mk 103s, and 12 PC-9 turboprop trainers with a limited combat capability. It has one squadron of 12 F-16C/D aircraft. Oman also has 4 A202-18 Bravos, and 8 MFI-17B Mushshaqs. The Royal Navy of Oman had 4,200 men in 2000, and is headquartered at Seeb. It has bases at Ahwi, Ghanam Island, Mussandam and Salalah. In 2006, Oman had 10 surface combat vessels. These included two 1,450-ton Qahir class corvettes, and 8 ocean-going patrol boats. The Omani Navy had one 2,500-ton Nasr al Bahr class LSL (240 troops, 7 tanks) with a helicopter deck. Oman also had at least four landing craft. 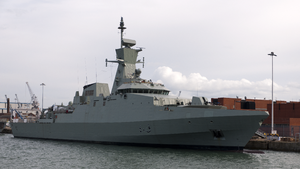 Oman ordered three Khareef class corvettes from the VT Group for £400 million in 2007. They are being built at Portsmouth. In 2010 Oman spent US$4.074 billion on military expenditures, 8.5% of the gross domestic product. The sultanate has a long history of association with the British military and defence industry. According to SIPRI, Oman was the 23rd largest arms importer from 2012–2016. The Sultanate is administratively divided into eleven governorates. Governorates are, in turn, divided into 60 wilayats. Oman's Basic Statute of the State expresses in Article 11 that the "national economy is based on justice and the principles of a free economy." By regional standards, Oman has a relatively diversified economy, but remains dependent on oil exports. Tourism is the fastest-growing industry in Oman. Other sources of income, agriculture and industry, are small in comparison and account for less than 1% of the country's exports, but diversification is seen as a priority by the government. Agriculture, often subsistence in its character, produces dates, limes, grains, and vegetables, but with less than 1% of the country under cultivation, Oman is likely to remain a net importer of food. Since a slump in oil prices in 1998, Oman has made active plans to diversify its economy and is placing a greater emphasis on other areas of industry, namely tourism and infrastructure. A free-trade agreement with the United States took effect 1 January 2009, eliminated tariff barriers on all consumer and industrial products, and also provided strong protections for foreign businesses investing in Oman. Tourism, another source of Oman's revenue, is on the rise. A popular event is The Khareef Festival held in Salalah, Dhofar, which is 1,200 km from the capital city of Muscat, during the monsoon season (August) and is similar to Muscat Festival. During this latter event the mountains surrounding Salalah are popular with tourists as a result of the cool weather and lush greenery, rarely found anywhere else in Oman. Oman's foreign workers send an estimated US$30 billion annually to their home states in Asia and Africa, more than half of them earning a monthly wage of less than US$400. The largest foreign community is from the Indian states of Kerala, Tamil Nadu, Karnataka, Maharashtra, Gujarat and the Punjab, representing more than half of entire workforce in Oman. Salaries for overseas workers are known to be less than for Omani nationals, though still from two to five times higher than for the equivalent job in India. Oman's proved reserves of petroleum total about 5.5 billion barrels, 25th largest in the world. Oil is extracted and processed by Petroleum Development Oman (PDO), with proven oil reserves holding approximately steady, although oil production has been declining. The Ministry of Oil and Gas is responsible for all oil and gas infrastructure and projects in Oman. Following the 1970s energy crisis, Oman doubled their oil output between 1979 and 1985. Between 2000 and 2007, production fell by more than 99%, from 972,000 to 714,800 barrels per day. Production has recovered to 816,000 barrels in 2009, and 930,000 barrels per day in 2012. Oman's natural gas reserves are estimated at 849.5 billion cubic meters, ranking 28th in the world, and production in 2008 was about 24 billion cubic meters per year. Tourism in Oman has grown considerably recently, and it is expected to be one of the largest industries in the country. The World Travel & Tourism Council stated that Oman is the fastest growing tourism destination in the Middle East. Oman has one of the most diverse environments in the Middle East with various tourist attractions and is particularly well known for adventure and cultural tourism. Muscat, the capital of Oman, was named the second best city to visit in the world in 2012 by the travel guide publisher Lonely Planet. 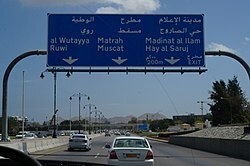 Muscat also was chosen as the Capital of Arab Tourism of 2012. As of 2014[update], Oman's population is over 4 million, with 2.23 million Omani nationals and 1.76 million expatriates. The total fertility rate in 2011 was estimated at 3.70. Oman has a very young population, with 43 percent of its inhabitants under the age of 15. Nearly 50 percent of the population lives in Muscat and the Batinah coastal plain northwest of the capital. Omani people are predominantly of Arab, Baluchi and African origins. Omani society is largely tribal and encompasses three major identities: that of the tribe, the Ibadi faith, and maritime trade. The first two identities are closely tied to tradition and are especially prevalent in the interior of the country, owing to lengthy periods of isolation. The third identity pertains mostly to Muscat and the coastal areas of Oman, and is reflected by business, trade, and the diverse origins of many Omanis, who trace their roots to Baloch, Al-Lawatia, Persia, and historical Omani Zanzibar. Consequently, the third identity is generally seen to be more open and tolerant towards others, and is often in tension with the more traditional and insular identities of the interior. Islam (official; majority are Ibadi and less Sunni and Shia) 85.9%, Christian 6.5%, Hindu 5.5%, Buddhist 0.8%, Jewish <0.1, Other 1%, Unaffiliated 0.2%. The Oman government does not keep statistics on religious affiliation, but most Omanis are Muslims, most of whom follow the Ibadi School of Islam, followed by the Twelver school of Shia Islam and Shafi`i school of Sunni Islam. Virtually all non-Muslims in Oman are foreign workers. Non-Muslim religious communities include various groups of Jains, Buddhists, Zoroastrians, Sikhs, Jews, Hindus and Christians. Christian communities are centred in the major urban areas of Muscat, Sohar, and Salalah. These include Catholic, Eastern Orthodox, and various Protestant congregations, organizing along linguistic and ethnic lines. More than 50 different Christian groups, fellowships, and assemblies are active in the Muscat metropolitan area, formed by migrant workers from Southeast Asia. There are also communities of ethnic Indian Hindus and Christians. Muscat has two Hindu temples. One of them is over a hundred years old. There is a significant Sikh community in Oman. Though there are no permanent gurdwaras, many smaller gurdwaras in makeshift camps exist and are recognised by the government. The Government of India had signed an accord in 2008 with the Omani government to build a permanent gurdwara but little progress has been made on the matter. Arabic is the official language of Oman. It belongs to the Semitic branch of the Afroasiatic family. Prior to Islam, Central Oman lay outside of the core area of spoken Arabic. Possibly Old South Arabian speakers dwelled from the Bāṭinah to Ẓafār. Rare Musnad inscriptions have come to light in central Oman and in the Emirate of Sharjah, but the script says nothing about the language which it conveys. A bilingual text from the 3rd century BCE is written in Aramaic and in musnad Hasiatic, which mentions a 'king of Oman' (mālk mn ʿmn). Today the Mehri language is limited in its distribution to the area around Ṣalālah in Ẓafār and westward into the Yemen. But until the 18th or 19th century it was spoken further north, perhaps into Central Oman. Baluchi (Southern Baluchi) is widely spoken in Oman. Endangered indigenous languages in Oman include Kumzari, Bathari, Harsusi, Hobyot, Jibbali and Mehri. Omani Sign Language is the language of the deaf community. Oman was also the first Arab country in the Persian Gulf to have German taught as a second language. The Bedouin Arabs, who reached eastern and south-eastern Arabia in migrational waves -the latest in the 18th century, brought their language and rule including the ruling families of Bahrain, Qatar and the United Arab Emirates. At the most basic level, there are two kinds of dialects, those of settlers and those of Bedouin which share some features. Omani dialects preserve much vocabulary which has been lost in other Arabic dialects. C. Holes has argued convincingly that Omani Arabic has indigenous characteristics of its own which do not derive from Bedouin central Arabia. They are better preserved than in neighbouring countries. According to the CIA, besides Arabic, English, Baluchi (Southern Baluchi), Urdu, and various Indian languages are the main languages spoken in Oman. English is widely spoken in the business community and is taught at school from an early age. Almost all signs and writings appear in both Arabic and English at tourist sites. Baluchi is the mother tongue of the Baloch people from Balochistan in western-Pakistan, eastern Iran, and southern Afghanistan. It is also used by some descendants of Sindhi sailors. A significant number of residents also speak Urdu, due to the influx of Pakistani migrants during the late 1980s and 1990s. 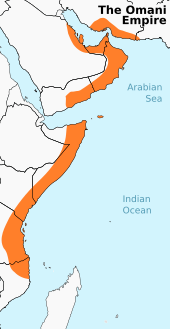 Additionally, Swahili is widely spoken in the country due to the historical relations between Oman and Zanzibar. Outwardly, Oman shares many of the cultural characteristics of its Arab neighbours, particularly those in the Gulf Cooperation Council. Despite these similarities, important factors make Oman unique in the Middle East. These result as much from geography and history as from culture and economics. The relatively recent and artificial nature of the state in Oman makes it difficult to describe a national culture; however, sufficient cultural heterogeneity exists within its national boundaries to make Oman distinct from other Arab States of the Persian Gulf. Oman's cultural diversity is greater than that of its Arab neighbours, given its historical expansion to the Swahili Coast and the Indian Ocean. Oman has a long tradition of shipbuilding, as maritime travel played a major role in the Omanis' ability to stay in contact with the civilisations of the ancient world. Sur was one of the most famous shipbuilding cities of the Indian Ocean. The Al Ghanja ship takes one whole year to build. 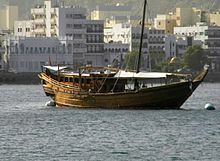 Other types of Omani ship include As Sunbouq and Al Badan. In March 2016 archaeologists working off Al Hallaniyah Island identified a shipwreck believed to be that of the Esmeralda from Vasco da Gama's 1502–1503 fleet. The wreck was initially discovered in 1998. Later underwater excavations took place between 2013 and 2015 through a partnership between the Oman Ministry of Heritage and Culture and Blue Water Recoveries Ltd., a shipwreck recovery company. The vessel was identified through such artifacts as a "Portuguese coin minted for trade with India (one of only two coins of this type known to exist) and stone cannonballs engraved with what appear to be the initials of Vincente Sodré, da Gama's maternal uncle and the commander of the Esmeralda." The male national dress in Oman consists of the dishdasha, a simple, ankle-length, collarless gown with long sleeves. Most frequently white in colour, the dishdasha may also appear in a variety of other colours. Its main adornment, a tassel (furakha) sewn into the neckline, can be impregnated with perfume. Underneath the dishdasha, men wear a plain, wide strip of cloth wrapped around the body from the waist down. The most noted regional differences in dishdasha designs are the style with which they are embroidered, which varies according to age group. On formal occasions a black or beige cloak called a bisht may cover the dishdasha. The embroidery edging the cloak is often in silver or gold thread and it is intricate in detail. the ghutra, also called “Musar” a square piece of woven wool or cotton fabric of a single colour, decorated with various embroidered patterns. the kummah, a cap that is the head dress worn during leisure hours. Some men carry the assa, a stick, which can have practical uses or is simply used as an accessory during formal events. Omani men, on the whole, wear sandals on their feet. 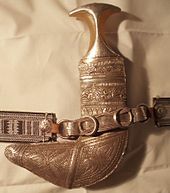 The khanjar (dagger) forms part of the national dress and men wear the khanjar on all formal public occasions and festivals. It is traditionally worn at the waist. Sheaths may vary from simple covers to ornate silver or gold-decorated pieces. It is a symbol of a man's origin, his manhood and courage. A depiction of a khanjar appears on the national flag. Omani women wear eye-catching national costumes, with distinctive regional variations. All costumes incorporate vivid colours and vibrant embroidery and decorations. In the past, the choice of colours reflected a tribe's tradition. The Omani women's traditional costume comprises several garments: the kandoorah, which is a long tunic whose sleeves or radoon are adorned with hand-stitched embroidery of various designs. The dishdasha is worn over a pair of loose fitting trousers, tight at the ankles, known as a sirwal. Women also wear a head shawl most commonly referred to as the lihaf. As of 2014[update] women reserve wearing their traditional dress for special occasions, and instead wear a loose black cloak called an abaya over their personal choice of clothing, whilst in some regions, particularly amongst the Bedouin, the burqa is still worn. Women wear hijab, and though some women cover their faces and hands, most do not. The Sultan has forbidden the covering of faces in public office. Music of Oman is extremely diverse due to Oman's imperial legacy. There are over 130 different forms of traditional Omani songs and dances. The Oman Centre for Traditional Music was established in 1984 to preserve them. In 1985, Sultan Qaboos founded the Royal Oman Symphony Orchestra, an act attributed[by whom?] to his love for classical music. Instead of engaging foreign musicians, he decided to establish an orchestra made up of Omanis. On 1 July 1987 at the Al Bustan Palace Hotel's Oman Auditorium the Royal Oman Symphony Orchestra gave its inaugural concert. The cinema of Oman is very small, there being only one Omani film Al-Boom (2006) as of 2007[update]. Oman Arab Cinema Company LLC is the single largest motion picture exhibitor chain in Oman. It belongs to the Jawad Sultan Group of Companies, which has a history spanning more than 40 years in the Sultanate of Oman. In popular music, a seven-minute music video about Oman went viral, achieving 500,000 views on YouTube within 10 days of being released on YouTube in November 2015. The a cappella production features three of the region's most popular talents: Kahliji musician Al Wasmi, Omani poet Mazin Al-Haddabi and actress Buthaina Al Raisi. The government has continuously held a monopoly on television in Oman. Oman TV is the only state-owned national television channel broadcaster in Oman. It began broadcasting for the first time from Muscat on 17 November 1974 and separately from Salalah on 25 November 1975. On 1 June 1979, the two stations at Muscat and Salalah linked by satellite to form a unified broadcasting service. Currently, Oman TV broadcasts four HD channels, including Oman TV General, Oman TV Sport, Oman TV Live, and Oman TV Cultural. Although private ownership of radio and television stations is permitted, Oman has only one privately owned television channel. Majan TV is the first private TV channel in Oman. It began broadcasting on January, 2009. However, Majan TV's official channel website was last updated in early 2010. Moreover, the public has access to foreign broadcasts since the use of satellite receivers is allowed. Oman Radio is the first and only state-owned radio channel. It began broadcasting on the 30th, July 1970. It operates both Arabic and English networks. Other private channels include Hala FM, Hi FM, Al-Wisal, and Merge. In early 2018, Muscat Media Group (MMG), trend-setting media group founded by late Essa bin Mohammed Al Zedjali, launched a new private radio stations in hopes of catering educative and entertaining programs to the youth of the Sultanate. Oman has nine main newspapers, five in Arabic and four in English. Instead of relying on sales or state subsidies, private newspapers depend on advertising revenues to sustain themselves. The media landscape in Oman has been continuously described as restrictive, censored, and subdued. The Ministry of Information censors politically, culturally, or sexually offensive material in domestic or foreign media. The press freedom group Reporters Without Borders ranked the country 127th out of 180 countries on its 2018 World Press Freedom Index. In 2016, the government drew international criticism for suspending the newspaper Azamn and arresting three journalists after a report on corruption in the country's judiciary. Azamn was not allowed to reopen in 2017 although an appeal court ruled in late 2016 that the paper can resume operating. Traditional art in Oman stems from its long heritage of material culture. Art movements in the 20th century reveal that the art scene in Oman began with early practices that included a range of tribal handicrafts and self-portraiture in painting since the 1960s. However, since the inclusion of several Omani artists in international collections, art exhibitions, and events, such Alia Al Farsi, the first Omani artist to show at the last Venice biennale and Radhika Khimji, the first Omani artist to exhibit at both the Marrakesh and Haiti Ghetto biennale, Oman's position as a newcomer to the contemporary art scene in recent years has been more important for Oman's international exposure. Ancient irrigation system and water channels. Aflaj Gallery, The National Museum of Oman. Bait Muzna Gallery is the first art gallery in Oman. Established in 2000 by Sayyida Susan Al Said, Bait Muzna has served as a platform for emerging Omani artists to showcase their talent and place themselves on the wider art scene. In 2016, Bait Muzna opened a second space in Salalah to branch out and support art film and the digital art scene. The gallery has been primarily active as an art consultancy. The Sultanate's flagship cultural institution, The National Museum of Oman, opened on 30 July 2016 with 14 permanent galleries. It showcases national heritage from the earliest human settlement in Oman two million years ago through to the present day. The museum takes a further step by presenting information on the material in Arabic Braille script for the visually impaired, the first museum to do this in the Gulf region. The Omani Society for Fine Arts, established in 1993, offers educational programs, workshops and artist grants for practitioners across varied disciplines. In 2016, the organization opened its first exhibition on graphic design. It also hosted the “Paint for Peace” competition with 46 artists in honor of the country's 46th National Day, where Mazin al-Mamari won the top prize. The organization has additional branches in Sohar, Buraimi and Salalah. Bait Al- Zubair Museum is a private, family-funded museum that opened its doors to the public in 1998. In 1999, the museum received Sultan Qaboos’ Award for Architectural Excellence. Bait Al Zubair displays the family's collection of Omani artifacts that spans a number of centuries and reflect inherited skills that define Oman's society in the past and present. Located within Bait Al-Zubair, Gallery Sarah, which opened in October 2013, offers an array of paintings and photographs by established local and international artists. The gallery also occasionally holds lectures and workshops. Omani cuisine is diverse and has been influenced by many cultures. Omanis usually eat their main daily meal at midday, while the evening meal is lighter. During Ramadan, dinner is served after the Taraweeh prayers, sometimes as late as 11 pm. However, these dinner timings differ according to each family; for instance, some families would choose to eat right after maghrib prayers and have dessert after taraweeh. Arsia, a festival meal served during celebrations, consists of mashed rice and meat (sometimes chicken). Another popular festival meal, shuwa, consists of meat cooked very slowly (sometimes for up to 2 days) in an underground clay oven. The meat becomes extremely tender and it is infused with spices and herbs before cooking to give it a very distinct taste. Fish is often used in main dishes too, and the kingfish is a popular ingredient. Mashuai is a meal consisting of a whole spit-roasted kingfish served with lemon rice. Rukhal bread is a thin, round bread originally baked over a fire made from palm leaves. It is eaten at any meal, typically served with Omani honey for breakfast or crumbled over curry for dinner. Chicken, fish, and lamb or mutton are regularly used in dishes. The Omani halwa is a very popular sweet, basically consisting of cooked raw sugar with nuts. There are many different flavors, the most popular ones being black halwa (original) and saffron halwa. Halwa is considered as a symbol of Omani hospitality, and is traditionally served with coffee. As is the case with most Arab states of the Persian Gulf, alcohol is only available over-the-counter to non-Muslims. Muslims can still purchase alcoholic drinks. Alcohol is served in many hotels and a few restaurants. Oman hosted and won the 19th Arabian Gulf Cup. In October 2004, the Omani government set up a Ministry of Sports Affairs to replace the General Organization for youth, sports and cultural affairs. The 19th Arabian Gulf Cup, the 19th edition, took place in Muscat, from 4 to 17 January 2009 and was won by the Omani national football team. The 23rd Arabian Gulf Cup, the 23rd edition, that took place in Kuwait, from 22 December 2017 until January 5, 2018. Oman won their second title, defeating the United Arab Emirates in the final on penalties following a goalless draw. Oman's traditional sports are dhow racing, horse racing, camel racing, bull fighting and falconry. Association football, basketball, waterskiing and sandboarding are among the sports that have emerged quickly and gained popularity among the younger generation. Ali Al-Habsi is an Omani professional association football player. As of 2015[update], he plays in the Football League Championship as a goalkeeper for Reading. The International Olympic Committee awarded[when?] the former GOYSCA its prestigious prize for Sporting excellence in recognition of its contributions to youth and sports and its efforts to promote the Olympic spirit and goals. The Oman Olympic Committee played a major part in organizing the highly successful 2003 Olympic Days, which were of great benefit to the sports associations, clubs and young participants. The football association took part, along with the handball, basketball, rugby union, hockey, volleyball, athletics, swimming, and tennis associations. In 2010 Muscat hosted the 2010 Asian Beach Games. Oman also hosts tennis tournaments in different age divisions each year. The Sultan Qaboos Sports Complex stadium contains a 50-meter swimming pool which is used for international tournaments from different schools in different countries. The Tour of Oman, a professional cycling 6-day stage race, takes place in February. Oman hosted the Asian 2011 FIFA Beach Soccer World Cup qualifiers, where 11 teams competed for three spots at the FIFA World Cup. Oman hosted the Men's and Women's 2012 Beach Handball World Championships at the Millennium Resort in Mussanah, from 8 to 13 July. 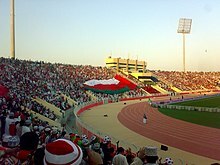 Oman has competed repeatedly for a position in the FIFA World Cup, but have yet qualified to compete in the tournament. Oman, along with Fujairah in the UAE, are the only regions in the Middle East that have a variant of bullfighting, known as 'bull-butting', organized within their territories. Al-Batena area in Oman is specifically prominent for such events. It involves two bulls of the Brahman breed pitted against one another and as the name implies, they engage in a forceful barrage of headbutts. The first one to collapse or concede its ground is declared the loser. Most bull-butting matches are short affairs and last for less than 5 minutes. The origins of bull-butting in Oman remain unknown, but many locals believe it was brought to Oman by the Moors of Spanish origin. Yet others say it has a direct connection with Portugal, which colonized the Omani coastline for nearly two centuries. In Cricket, Oman qualified for the 2016 ICC World Twenty20 by securing sixth place in 2015 ICC World Twenty20 Qualifier. They have also been granted T20I status as they were among the top six teams in the qualifiers. The adult literacy rate in 2010 was 86.9%. Before 1970, only three formal schools existed in the entire country, with fewer than 1,000 students. Since Sultan Qaboos' ascension to power in 1970, the government has given high priority to education in order to develop a domestic work force, which the government considers a vital factor in the country's economic and social progress. Today, there are over 1,000 state schools and about 650,000 students. Oman's first university, Sultan Qaboos University, opened in 1986. The University of Nizwa is one of the fastest growing universities in Oman. Other post-secondary institutions in Oman include the Higher College of Technology and its six branches, six colleges of applied sciences (including a teacher's training college), a college of banking and financial studies, an institute of Sharia sciences, and several nursing institutes. Some 200 scholarships are awarded each year for study abroad. According to the Webometrics Ranking of World Universities, the top-ranking universities in the country are Sultan Qaboos University (1678th worldwide), the Dhofar University (6011th) and the University of Nizwa (6093rd). Life expectancy at birth in Oman was estimated to be 76.1 years in 2010. As of 2010[update], there were an estimated 2.1 physicians and 2.1 hospital beds per 1,000 people. In 1993, 89% of the population had access to health care services. In 2000, 99% of the population had access to health care services. During the last three decades, the Oman health care system has demonstrated and reported great achievements in health care services and preventive and curative medicine. In 2001, Oman's health system was ranked number 8 by the World Health Organization. ^ In 1783, when Seyyid Said succeeded to the "masnad" of Muscat and Oman (an independent state founded in 1749), he fell out with his brother Seyyid Sultan, who fled to safety in Makran and entered into communication with Nasir Khan of Kalat. Said was granted the Kalat share of the revenues of Gwadar and lived there until 1797 when he came to rule over Muscat and Oman. ^ "Cabinet Ministers". Government of Oman. Archived from the original on 22 December 2013. Retrieved 13 October 2010. ^ Oman. MSN Encarta. Archived from the original on 1 November 2009. In 751 Ibadi Muslims, a moderate branch of the Kharijites, established an imamate in Oman. Despite interruptions, the Ibadi imamate survived until the mid-20th century. ^ "Final Results of Census 2010" (PDF). National Center for Statistics & Information. Archived from the original (PDF) on 18 May 2013. Retrieved 7 January 2012. ^ a b Kharusi, N. S. (2012). "The ethnic label Zinjibari: Politics and language choice implications among Swahili speakers in Oman". Ethnicities. 12 (3): 335–353. doi:10.1177/1468796811432681. ^ Al Basami, Mubarak (April 2016). "Oman - UK Relations". BePress. ^ a b c d e f g h i j k l m n o p q r s t u v w x y z aa "Country Report: Oman". BTI Project. 2016. Retrieved 19 August 2016. ^ "Arab uprising: Country by country – Oman". BBC News. 2013. Retrieved 29 December 2014. ^ a b "Oman profile – Overview". BBC News. 11 September 2012. Retrieved 18 January 2013. ^ "Private sector gets Omanisation targets". Gulf News. 13 February 2011. Retrieved 18 January 2013. ^ "Five Arab states among top leaders in long-term development gains". Hdr.undp.org. 4 November 2010. Archived from the original on 9 November 2013. Retrieved 29 October 2011. ^ "Global Peace Index: 2017" (PDF). visionofhumanity.org. Global Peace Index and Institute for Economics and Peace. p. 11. Retrieved 5 December 2017. ^ Rose, J. I.; Usik, V. I.; Marks, A. E.; Hilbert, Y. H.; Galletti, C. S.; Parton, A.; Geiling, J. M.; Černý, V.; Morley, M. W.; Roberts, R. G. (2011). "The Nubian Complex of Dhofar, Oman: An African Middle Stone Age Industry in Southern Arabia". PLoS ONE. 6 (11): e28239. doi:10.1371/journal.pone.0028239. PMC 3227647. PMID 22140561. ^ Jeffrey I. Rose et al., The Nubian Complex of Dhofar, Oman: An African Middle Stone Age Industry in Southern Arabia, Plos November 30, 2011 doi:10.1371/journal.pone.0028239. ^ Thornton, Christopher; Cable, Charlotte; Possehl, Gregory (2016). The Bronze Age Towers at Bat, Sultanate of Oman…2007-12. University of Pennsylvania Museum. ISBN 9781934536063. ^ "Digging in the Land of Magan – Archaeology Magazine Archive". Archive.archaeology.org. Retrieved 14 January 2014. ^ "Oman: The Lost Land". Saudi Aramco World. March 1983. Archived from the original on 6 October 2014. Retrieved 14 January 2014. ^ "Oman: A History". Saudi Aramco World. March 1983. Retrieved 14 January 2014. ^ Feuerstein, Georg; Kak, Subhash & Frawley, David (2005). The Search of the Cradle of Civilization: New Light on Ancient India. Motilal Banarsidass Publisher. p. 119. ISBN 8120820371. ^ Wilkinson, John (1977). Water and Tribal Settlement in South East Arabia - A Study of the Aflaj of Oman. Clarendon Press. pp. 76, 85, 122, 126–130, 132. ISBN 0198232179. ^ Yule, Paul (2014). Cross-roads Early and Late Iron Age South-Eastern Arabia. Harrassowitz Verlag. pp. 15–18. ISBN 9783447101271. ^ "History of OMAN". Historyworld.net. Retrieved 17 April 2010. ^ "Oman". United States Department of State. 31 March 2010. Retrieved 9 July 2010. Oman adopted Islam in the seventh century A.D., during the lifetime of Muhammad. ^ Holt, Peter Malcolm; Lambton, Ann K. S. and Lewis, Bernard (1977) The Cambridge history of Islam, Cambridge University Press, ISBN 0521291364. ^ a b Benjamin Plackett (30 March 2017). "Omani Music Masks A Slave Trading Past". Al-Fanar Media. Retrieved 17 July 2017. ^ Cowasjee, Ardeshir (11 September 2005). "DAWN – Cowasjee Corner; September 11, 2005". DAWN Group of Newspapers. Archived from the original on 9 June 2010. Retrieved 27 July 2010. ^ a b Meagher, John. "The Jebel Akhdar War Oman 1954–1959". Global Security. Retrieved 9 April 2012. ^ a b c "Jebel Akhdar". Britain's Small Wars. Archived from the original on 17 September 2013. Retrieved 10 April 2012. ^ Peterson, John E. (1978). Oman in the Twentieth Century: Political Foundations of an Emerging State. Croom Helm. p. 182. ISBN 9780856646294. ^ a b Ryan, Mike (2003). Secret Operations of the Sas. Zenith Imprint. pp. 68–70. ^ a b c Owtram, Francis (2004). A Modern History of Oman: Formation of the State since 1920. I.B.Tauris. p. 106. ^ "The Last Imam of Oman has Died in Saudi Arabia, CNN Arabic". ^ Nicolin, Beatrice (25 May 1998). "International trade networks: The Omani Enclave of Gwadar – Conference on German and International Research on Oman, Bonn 1998: abstracts". Bonn: Conference on German and International Research on Oman. Retrieved 27 July 2010. ^ "Happy and rich in an Omani toytown". The Economist. 31 August 2000. ^ "Oman appoints first female minister". BBC News. 4 March 2003. ^ "Oman profile – Timeline". BBC News. 11 September 2012. Retrieved 18 January 2013. ^ "Oman Geography 2007". home.kpn.nl. Retrieved 11 July 2016. ^ "Expedition Report: Dhofar Mountains Oman". 30 April 2011. Retrieved 11 July 2016. ^ a b Krogh, Jan S. "Oman". jankrogh.com. ^ 4th Swiss Geoscience Meeting, Bern 2006. Meteorite accumulation surfaces in Oman: Main results of. Omani-Swiss meteorite search campaigns, 2001–2006. by Beda Hofmann et al. ^ "Muscat (Seeb) Climate – Climate of Muscat (Seeb) Oman | World Climates". www.world-climates.com. Retrieved 11 July 2016. ^ "Oman—Country Pasture/Forage Resource Profiles". Food and Agriculture Organization. ^ "Salalah Climate – Climate of Salalah Oman | World Climates". www.world-climates.com. Retrieved 11 July 2016. ^ Snow blankets Oman's mountains as temperatures drop. Gulf News (16 February 2014). Retrieved 20 April 2014. ^ "Quriyat in Oman breaks world temperature record". CNN. 2018. ^ "UNESCO World Heritage Center – Oman's Arabian Oryx Sanctuary : first site ever to be deleted from UNESCO's World Heritage List". UNESCO. Retrieved 17 April 2010. ^ Ettinger, Powell. "Whales and dolphins of Oman – Dolphins, Humpbacks and Blue whales!". ^ Animal Tragedy. y-oman.com. 27 June 2013. ^ "Oman". Freedom House. Retrieved 18 January 2013. ^ "OMAN Majles A'Shura (Consultative Council)". Inter-Parliamentary Union. ^ "Oman". Freedom in the World 2012. Freedom House. ^ a b "Waking up too". The Economist. 23 June 2012. ^ Stork, Joe (19 December 2012). "Human rights in the smaller Persian Gulf states: Bahrain, Kuwait, Oman, Qatar and UAE". NOREF. Archived from the original on 8 March 2014. Retrieved 18 January 2013. ^ "Basic Statute of the State" (PDF). Royal Decree 101/96. Ministry of Legal Affairs. Archived from the original (PDF) on 23 July 2013. Retrieved 18 August 2012. ^ "Amendment to Some of the Provisions of the Basic Statute of the State" (PDF). Royal Decree 99/2011. Ministry of Legal Affairs. Archived from the original (PDF) on 17 January 2013. ^ a b "Country Profiles (Legislature) – Oman". Arab Parliaments. Archived from the original on 5 June 2012. ^ a b "Legislative Branch". The World Factbook. ^ a b "Torture in Oman". Gulf Center for Human Rights. 2014. Retrieved 29 December 2014. ^ a b c "BTI 2014 – Oman Country Report". BTI Project. 2014. Archived from the original on 28 December 2014. Retrieved 29 December 2014. ^ a b c d e f g h i j k l m "2013 Human Rights Reports: Oman". US Department of State. 2014. Retrieved 29 December 2014. ^ a b "Oman: Events of 2018". Human Rights Watch. ^ a b c d e f g h i j k l m n o p q r s Whitaker, Brian (2011). "Oman's Sultan Qaboos: a classy despot". The Guardian. Retrieved 29 December 2014. ^ "Country Report: Oman" (PDF). BTI Project. 2016. p. 12. ^ "Oman: Journalists Sentenced Over Articles Alleging Corruption". Human Rights Watch. 3 October 2016. Retrieved 2 March 2017. ^ a b "Oman – Enforced disappearance of human rights defender Mr Mohamed Al Fazari". Front Line Defenders. 2014. Archived from the original on 28 December 2014. Retrieved 29 December 2014. ^ a b c d e f "Human rights". amnesty.org. ^ a b c "Oman: Enforced disappearance of a Yemeni citizen, Abdulrahman Ali Salem Mohammed, for more than six months". Archived from the original on 6 March 2016. ^ a b "Actor Sadiq AlShaabani: Arrested in Oman, Handed to Bahrain Authorities, Subjected to Enforced Disappearance". Bahrain Center for Human Rights. 2014. Retrieved 29 December 2014. ^ Susan Al Shahri (2012). "A Taboo Subject: The Desperate Plight of Domestic Workers in Oman". Mideast Posts. Retrieved 29 December 2014. ^ a b Susan Mubarak (2012). "Things We Don't Talk About". Muscat Daily. Retrieved 29 December 2014. ^ "Is Any Country in The Middle East Safe for Migrant Workers?". migrantrights.org. 2011. Retrieved 29 December 2014. ^ "An Indian ends life every sixth day in Oman". The Times of India. 2012. Retrieved 29 December 2014. ^ "Migrant Rights – Research". migrantrights.org. 2013. Retrieved 29 December 2014. ^ "Campaign in Oman to check suicide rate". Gulf News. 2012. Retrieved 29 December 2014. ^ "Global Slavery Index findings". globalslaveryindex.com. 2014. Retrieved 29 December 2014. ^ "Global Slavery Index" (PDF). 2014. p. 19. Archived from the original (PDF) on 1 January 2015. Retrieved 29 December 2014. ^ a b c d e f g h Khalid M. Al-Azri (2013). Social and Gender Inequality in Oman: The Power of Religious and Political Tradition. p. 40. ISBN 1138816795. ^ a b c d e "Oman". CIA – The World Factbook. Retrieved 29 October 2011. ^ "Oman: A Unique Foreign Policy". RAND. Retrieved 29 October 2011. ^ "The view from the Gulf: America's quiet go-between speaks". Fox News Channel. 31 January 2012. ^ "Omani Ministers Voice Increasing Concerns Over Region's Stability". Wikileaks. Archived from the original on 15 December 2011. Retrieved 29 October 2011. ^ "Oman Remains Wary Of Iranian Expansionism". Wikileaks. Archived from the original on 15 December 2011. Retrieved 29 October 2011. ^ "Admiral William J. Fallon's Meeting With Sultan Qaboos". Wikileaks. Archived from the original on 27 October 2011. Retrieved 29 October 2011. ^ Roy, Shubhajit (13 February 2018). "India gets access to strategic Oman port Duqm for military use, Chabahar-Gwadar in sight". Indian Express. ^ a b c d Anthony H. Cordesman; Khalid R. Al-Rodhan (28 June 2006). "The Gulf Military Forces in an Era of Asymmetric War" (PDF). Center for Strategic and International Studies. ^ "Testing times for corvette". Maritime Photographic. 15 March 2012. ^ "A balancing act". The Economist. 15 September 2009. ^ "TOP LIST TIV TABLES". SIPRI. ^ "About Oman". National Center for Statistics & Information. Archived from the original on 31 July 2013. ^ "Governorates of Sultanate Of Oman". Ministry of Information, Sultanate of Oman. Archived from the original on 8 December 2013. ^ a b "Basic Statute of the State" (PDF). Ministry Of Legal Affairs. Archived from the original (PDF) on 26 June 2012. ^ a b c Kharusi, N. S.; Salman, A. (September 2011). "The English Transliteration of Place Names in Oman". Journal of Academic and Applied Studies. 1 (3): 1–27. ^ "Arabia Tourism". Archived from the original on 29 April 2011. ^ a b "Indian migrant workers in Oman speak to the WSWS". Wsws.org. Retrieved 29 October 2011. ^ "Antony meets Indian diaspora in Oman". Thaindian.com. 18 May 2010. Retrieved 29 October 2011. ^ "Oman: proven oil reserves". Indexmundi.com. Retrieved 17 April 2010. ^ "Oman: Energy data". EIA. Archived from the original on 2 March 2011. Retrieved 16 February 2009. ^ "Home". Ministry of Oil and Gas. Archived from the original on 11 August 2013. ^ Gately, Dermot (1986). "Lessons from the 1986 Oil Price Collapsey" (PDF). Brookings Papers on Economic Activity (2): 239. Archived from the original (PDF) on 9 May 2016. ^ a b "Oman the comeback kid of oil". The National. 9 September 2012. Archived from the original on 31 December 2012. ^ "Travel & Leisure Market Research Reports and Industry Analysis". Marketresearch.com. Retrieved 9 June 2013. ^ "Oman Eyes Lucrative Business Tourism Market". Forbesmiddleeast. Retrieved 26 June 2017. ^ Thomas, Babu. "Culture in Oman, Tourism". Omanet.om. Archived from the original on 25 June 2013. Retrieved 9 June 2013. ^ I'Anson, Richard (7 June 2012). "Lonely Planet's Best in Travel: top 10 cities for 2012 – travel tips and articles". Lonely Planet. Retrieved 9 June 2013. ^ Andy Sambidge. "Oman's population passes 4 million mark". Arabian Business. ^ a b c "Major Economic & Social Indicators" (PDF). National Center for Statistics & Information. Archived from the original (PDF) on 14 May 2014. ^ Judith Miller (1997). "Creating Modern Oman: An Interview with Sultan Qabus". Foreign Affairs. Retrieved 29 December 2014. ^ Sulaiman al-Farsi (2013). Democracy and Youth in the Middle East: Islam, Tribalism and the Rentier State in Oman. pp. 170–197. ISBN 1780760906. ^ al Shaibany, Saleh (4 August 2010). "Omanis flocking to Zanzibar, their ancestral home". The National. Retrieved 30 June 2014. ^ "Middle East OMAN". CIA The World Factbook. ^ "Oman to allow temple, gurdwara". Sify.com. 24 November 2010. Retrieved 14 January 2014. ^ "Basic Information on Oman". Oman News Agency. Archived from the original on 5 December 2013. ^ "Interactive Atlas of the World's Languages in Danger". UNESCO. ^ "Oman first Gulf state to have German taught as second language". Al Arabiya. Archived from the original on 15 January 2013. Retrieved 19 January 2013. ^ Salman, Amel; Kharusi, Nafla S. (May 2012). "The Sound System of Lawatiyya". Journal of Academic and Applied Studies. 2 (5): 36–44. ^ a b "Culture of Oman". Sultanate of Oman. ^ a b c d e f Common, Richard K. "Barriers To Developing 'Leadership' In The Sultanate Of Oman" (PDF). International Journal of Leadership Studies. ^ "The Ship Building Industry". Ministry of Tourism, Sultanate of Oman. ^ Romey, Kristin (14 March 2016). "Shipwreck Discovered from Explorer Vasco da Gama's Fleet". National Geographic. Retrieved 15 March 2016. ^ a b c d "Culture". Omani Students Society. ^ a b "Women's Traditional Clothing". Oman Cultural Days Exhibition. Archived from the original on 9 April 2013. ^ "Introduction". Oman Centre for Traditional Music. Archived from the original on 15 March 2013. ^ "The Royal Oman Symphony Orchestra". Oman Tours. ^ "The Royal Oman Symphony Orchestra". Oman Observer. 9 November 2010. Archived from the original on 7 May 2013. ^ "#LoveOman video goes viral with 500, 000 views – Oman Observer". Oman Observer. 13 November 2015. Archived from the original on 27 August 2016. Retrieved 19 August 2016. ^ "Public Authority For Radio And Television Oman". ^ a b c "Oman profile - Media". BBC. 13 January 2015. ^ Katzman, Kenneth (9 November 2018). "Oman: Reform, Security, and U.S. Policy" (PDF). Congressional Research Service. ^ "Oman Radio - إذاعة سلطنة عمان". ^ "New radio stations T FM and Shabiba FM have officially launched in Oman". Times of Oman. 31 January 2018. ^ "Muscat Media Group Profile". Mediate. ^ "Oman". Freedom House. Retrieved 27 November 2018. ^ "The Media List". Mediate. ^ "2018 World Press Freedom Index | Reporters Without Borders". RSF. Retrieved 27 November 2018. ^ "Oman". freedomhouse.org. Retrieved 27 November 2018. ^ Mazin, Aisha (16 June 2016). "Contemporary Art In Oman: Spaces And Places". The Collectionair's Journal. ^ a b c d Choudhry, Sudipta (2017). "Oman". ART AsiaPacific. 12. ^ "Oman National Museum a showcase of Sultanate's heritage and values". Times of Oman. Retrieved 28 November 2018. ^ "baitmuzna | Our Story". baitmuzna. Retrieved 27 November 2018. ^ "Bait Al Zubair | Bait Al Zubair". www.baitalzubair.com. Retrieved 27 November 2018. ^ a b Nazneen Akbari Traditional sports in Oman – relics of the rich Arabian history, Your Middle East, 29 April 2013. Retrieved 11 January 2016. ^ "Sky Sports Profile". Skysports.com. Archived from the original on 14 May 2013. Retrieved 29 October 2011. ^ "The Beach Handball 2012 World Championships". 8 July 2012. Retrieved 24 September 2012. ^ a b "Bullfighting à la Batinah". Rough Guides. ^ Osborne, Chrisitne. "Bullfighting: Omani Style". Travels With My Hat. ^ "Serving Mangaloreans Around The World!". Mangalorean.Com. 1 May 2005. Archived from the original on 1 October 2011. Retrieved 29 October 2011. ^ "Oman". Ranking Web of Universities. Archived from the original on 21 February 2014. Retrieved 26 February 2013. ^ "World Health Organization Assesses the World's Health Systems". World Health Organization. Scholia has a topic profile for Oman. Ministry of Tourism (official government website). Ministry of Information (official government website). "Oman". The World Factbook. Central Intelligence Agency. Oman from the BBC News. This page was last edited on 21 April 2019, at 03:50 (UTC).